Now is the best time to travel and help out struggling economies further afield. Cheapflights.com.au, the travel deals comparison site, has just the ticket for your next trip. The website spills the brew on the world’s best Oktoberfests outside of Germany and teaches travellers the many ways to cheers in destinations that aren’t normally top of mind when it comes to beer. When Germany’s Crown Prince Ludwig married in 1810, who could have predicted that the beer guzzling tradition for celebrating his marriage would continue 200 years later? Today, this two week festival has become a tradition not only for Germany, but for countries throughout literally every corner of the globe from Hong Kong to Cincinnati and Namibia to Vietnam. “Whether you’re celebrating in Oz or jetting off to a cooler location elsewhere, the variety of festivals available means there will be one to suit every taste,” adds Shiel. Grab a glass and take your pick of the Top 10 Oktoberfests outside of Germany, starting with these first five. Brisbane, Australia: ‘Down the hatch, mate!’… no explanation required! 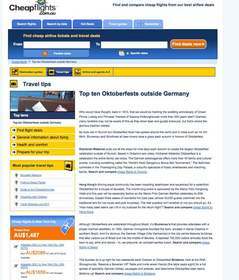 For the full list of Top 10 Oktoberfests outside of Germany, visit http://www.cheapflights.com.au/travel-tips/top-ten-oktoberfests-outside-germany/.